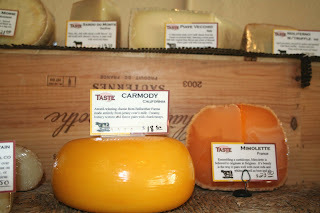 Years ago I was invited to the CIA at Greystone in St. Helena for a three-day cheese course. It was a total immersion that also included wine pairings, learning how to make homemade mozzarella and even how to make corn tortillas. I tasted everything from the nutty Vella Dry Monterey Jack and luscious Strauss organic yogurt to Bellwether Farm’s oh-so-gooey Crescenza (try it on focaccia with a little truffle oil drizzled on top). 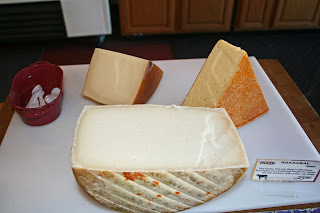 I met many of the local cheese makers as well as local wine makers and even got a chance to cook in the CIA kitchen to try out new cheese-infused recipes. It was fabulous. Then I came home to San Diego. While other writers and editors were swooning over the cheeses and making notes of specialty cheeses to pick up at their local cheese shop back in San Francisco, I could only hope that some of these cheese makers could do mail orders. My best hope back then was that perhaps Whole Foods might carry some of the bounty I’d discovered and fallen in love with. Times certainly have changed and here we are at the end of 2007 with three thriving cheese shops in San Diego—Venissimo, Aniata and Taste—along with pretty good selections at Whole Foods, Bristol Farms, Trader Joe’s and other more enlightened markets. 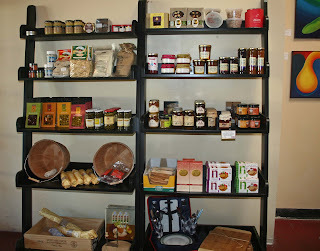 Despite carrying very similar products, each of our local cheese shops is wonderfully unique. Having spent an afternoon at Taste last week I’m going to declare it the party shop. This is where to go not just for wonderful cheeses and other epicurean treats, but to simply have a good time. And, why not? It is in Hillcrest after all and shares space with Wine Steals next door. Call a friend and meet up on a weekend afternoon for a glass of wine and an international tour of fabulous cheeses. Go this weekend and pick up last-minute holiday or hostess gifts or fill the larder for the inevitable parties you're hosting or attending through New Year's. Owned by Mary and George Palmer, Taste is a true reflection of their gregarious, open-armed approach to retail. Their clear enthusiasm for playing with food and educating customers is very endearing and will likely send you out the door with several delicious bundles. There are no counters at Taste. The cheeses are on display on tables and shelves or in the refrigerated case that lines the wall next to a collage of cheese labels that goes to the ceiling. Want to sample something? 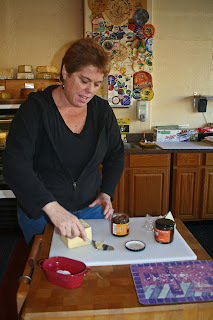 Mary will bring the cheese to one of the tables to slice and probably tempt you with a pairing or two. 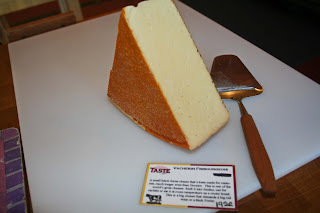 Enjoy the deep muskiness and incredible sharpness of Old Quebec vintage cheddar? Try it with a dab of red onion confit. It improves the taste of both. How about Colston Bassett Stilton? Oh, it’s mellow. But with a little dried fig compote mellow turns to memorable. The ultimate? Parmesiano Reggiano with rich, syrupy 12-year-old balsamico. Stunning on the palate. 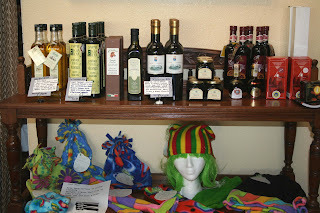 Jars of these confits, compotes and vinegars are displayed throughout the store, along with local artwork that’s also for sale. 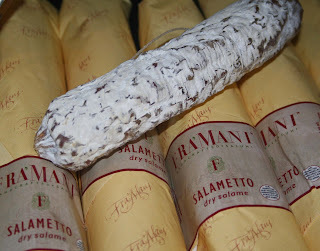 One wall of shelves holds gems like truffle salt (perfect on eggs, pasta or steak), honeys, pasta, crackers, olives and the very special Fra’Mani dry salami made by former Chez Panisse chef Paul Bertolli. Try this—it’s very mild but carries a splendid burst of garlic. On a table against another wall are rich and fruity olive oils from Spain, Portugal and Italy, and balsamicos varying in age from 12 to 25 to 40 years. 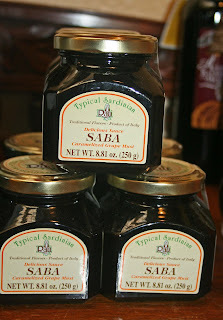 And, from Sardinia, there are jars of Saba, a very sweet grape must that’s made by reducing grape juice to a syrup. (Grape must is the juice pressed from grapes before fermentation; it's also used to make balsamic vinegar, which then undergoes fermentation as it ages.) With must, acid plays no role, nor does age. It’s all about the reduction and this sauce marries well with oil to create marinades and dress salads, but use it solo over ice cream, fruit or pastries. Another table nearby is all about chocolate. 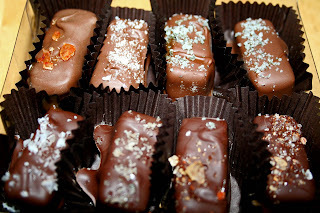 There are the elegant orange boxes of hand-crafted local chocolates by Dallmann Confections in flavors like jasmine, pistachio, fleur de sel, Provence (lavender, of course, with Bourbon vanilla) and rose water. Taste also features Eclipse Chocolat made by local artisan chocolatier Will Gustwiller (his shop is on El Cajon Blvd. in North Park). Try his exotic salted caramels, rich distinctive flavors topped by just a sprinkling of artisanal salts and infused with flavors like ginger and lavender. These are perfect and unusual holiday gifts. 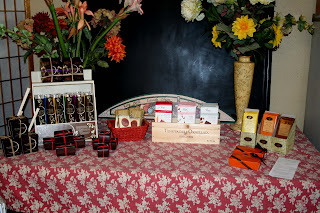 Also on display are bars of Vosges, Casa Don Puglisi chocolate from Modica and Chocolates El Rey from Venezuela. I enjoyed the smooth as silk sweetness of the Bucare dark chocolate bar. Mary and George moved to San Diego several years ago from the Bay Area. They started as wine geeks but began focusing on food, especially cheese. It was George’s idea to start a cheese shop and they met Bob and Martyna Stonebrook who opened Aniata in Flower Hill Mall in 2001. Bob invited the Palmers to come work for him to learn about the business and the groundwork was set. Three years ago the couple opened Taste on University Ave. and have been building the business since. The Palmers share resources with Venissimo, whose owners have since bought Aniata so that the Stonebrooks could focus on distributing cheese. The same fabulous blue-and-white cheese paper you see at Venissimo is also used by Taste (more about that later), but the collaboration also allows them to split wheels of cheese that would otherwise be too much stock for one shop to carry. Parmigiano Reggiano: Taste carries a Reggiano Doc, meaning that it is certified as coming from Northern Italy and meets the Parmigiano Reggiano cheese Consorzio criteria. It’s branded with the Consorzio’s logo once it’s been inspected and passed at 12 months. Cut straight from the wheel, this hard, granular cheese resembles nothing like the stuff in the green cardboard container. It’s earthy and crumbly—irresistible to nibble in little slices with a red wine or dry champagne. 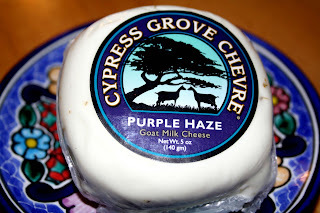 Purple Haze: I love chevre and this soft goat’s milk cheese ups the ante with the addition of lavender and fennel pollen. 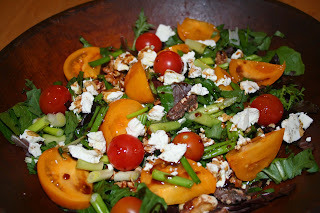 Because it’s so perfect crumbled in a salad, I pulled out my Grandma Anna’s weathered old wood salad bowl and filled it with organic baby romaine, fresh mizuna from Nijiya, chopped scallions, toasted walnuts, orange heirloom tomatoes from the farmers market and ruby red cherry tomatoes. No vinaigrette on this salad—just a good drizzle of unfiltered Italian extra virgin olive oil and Saba. Now, I loved the Purple Haze in the salad, but Mary also suggests adding it to mashed potatoes at the end of preparation. 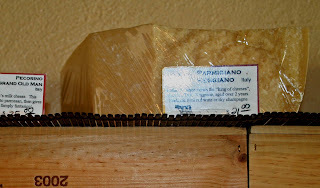 Ewephoria: This Dutch ewe’s milk cheese is one of my favorites because it is all big nutty flavor. I adore it on toast in the morning but try slices on a crisp apple or pear accompanied by a big, robust red wine. Idiazabal: This is a something of a curiosity. It's a raw sheep’s milk cheese from Spain that has a burst of smokiness but, surprisingly, it actually isn't a smoked cheese. Instead, it gets that crazy flavor because it’s aged in chimneys. Go figure. But, it’s a tremendous hard cheese—nutty and just a little oily. St. Agur: Oh, I did love this blue cheese from France’s Auvergne region. This is simply one of the best blue cheeses you’ll find because it’s so creamy. A full fat blue, it has a sumptuous flavor that finishes with bacon. Dreamy. 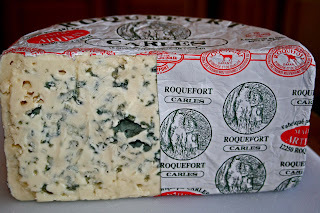 Roquefort Carles: Another sumptuous blue cheese that comes, of course, from Roquefort. It’s strong, it’s tangy and I adore it. Vacherin Fribourgeois: My grandpa Sam was a stinky cheese kind of guy, and was especially fond of the astoundingly pungent Limberger. He’d have loved this strong smelling small batch Swiss cheese. I certainly did. While he would have eaten it straight up, you might want to balance the strong flavor with some crusty bread and a robust red wine or Porter. Mary suggests using it for fondue or raclette. I tried a lot of different cheeses at Taste but bought only a few because I hate the idea of these magnificently living foodstuffs going moldy or hard before I can finish them. Cheese storage has been on my mind and over the years I’ve gotten a lot of different advice on how best to keep cheese fresh. Aside from buying small portions and eating them promptly, what do you do? First some don’ts: don’t wrap them in plastic wrap, Ziploc bags or moistened paper towels covered by wax paper. Instead, Mary pointed directly at the lined blue-and-white paper she wraps the cheeses in. She calls it “Gore-Tex” for cheese. The liner wicks moisture from the cheese. The paper keeps the cheese dry. You can also use parchment or wax paper enveloped in foil. Label your little packages with a Sharpie pen. They should keep for several days. Ideally, you don’t buy more than what you can eat fairly quickly. 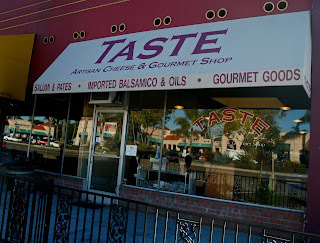 Taste Artisan Cheese & Gourmet Shop is located at 1243 ½ University Ave. in Hillcrest.